3 at the Rabobank Arena in Bakersfield, California, following GHOST 's special guest summer slot on METALLICA ' s 25th date "WorldWide" European stadium tour. A series of ticket pre-sales starts tomorrow, April 2 at 10 am.m. local; tickets for the "Ultimate Tour Named Death" go on sale at the general public beginning this Friday, April 5 at 10 a.m local. San Antonio's three-time Grammy -nominated alt / rock band NOTHING MORE which earned three Top 10 singles from their most recent album "The Stories We Tell Ourselves "will provide support for the tour. 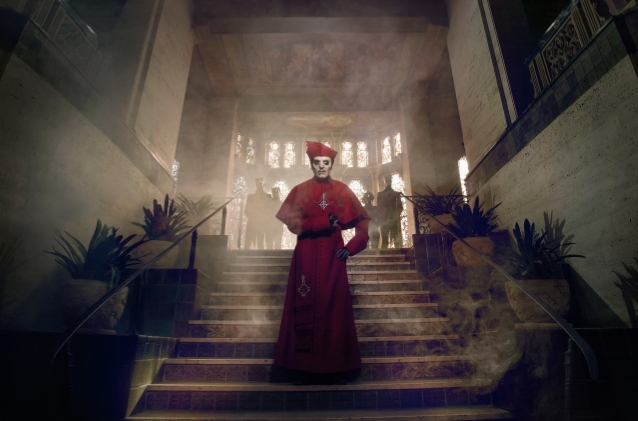 In December, GHOST nabbed two Grammy nominations, "Best Rock Album" for "Prequelle" and "Best Rock Song" for "Rats" . Three years ago, GHOST became the first Swedish rock band ever to win Grammy – 2016's "Best Metal Performance" for the song "Cirice"
GHOST leader Tobias Forge recently said that his current stage persona, Cardinal Copia has a very good chance of sticking around for the band's next studio album. Forge performed as a "new" Papa Emeritus on each of the group's first three LPs, with each version of Papa replacing the one that came before IT. Papa Emeritus III was retired in favor of Cardinal Copia before the release of last year's "Prequelle"
Forge duty Billboard which is already focused on the band's next recording project, with plans to be in the studio again by the beginning of 2020.